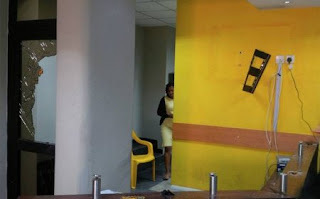 Following the recent xenophobic attacks on foreigners by South Africans, Nigeria protesters in the capital, Abuja on Thursday(today) took it upon their selves to vandalize properties of the South Africa giant communication firm in Nigeria, MTN in form of retaliation. A South African government source described the attack as serious. "This wasn't just some people on the street throwing stones. They broke into the building and stole things and broke things," The report stated, "They vandalized equipment, stole customer phones and I-Pads. Some customers too were attacked." Coincidentally, the attack follows the MTN chairman Phuthuma Nhleko visit to the Abuja to see Vice-President Yemi Osinbajo, who has been in charge for the last month in the absence on sick leave of President Muhammadu Buhari. So far, no human causality recorded. Our ears are on ground so as to enable us bring you latest story on this trend.